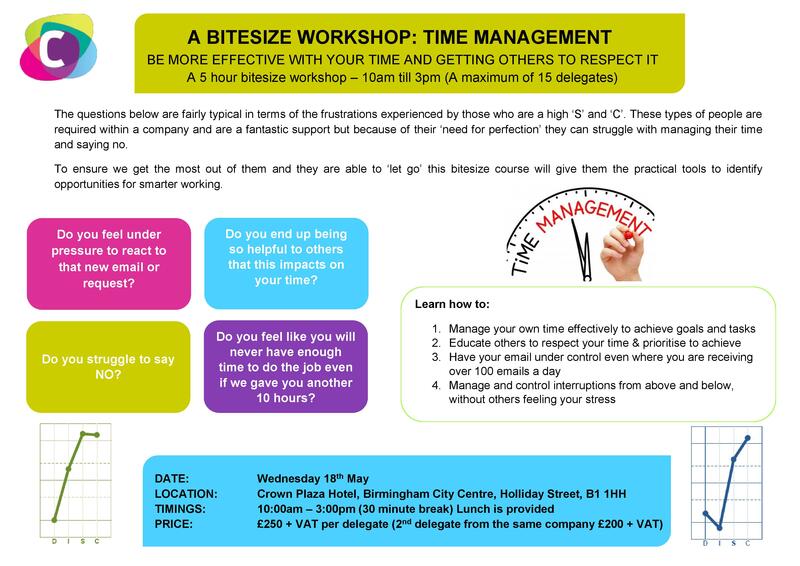 THIS WORKSHOP IS NOW FULLY BOOKED – WE ARE RUNNING COPY OF THIS EVENT THE DAY LATER ON THE 19TH MAY. FOR FURTHER DETAILS CLICK HERE. The questions below are fairly typical in terms of the frustrations experienced by those who are a high ‘S’ and ‘C’. These types of people are required within a company and are a fantastic support but because of their ‘need for perfection’ they can struggle with managing their time and saying no. To ensure we get the most out of them and they are able to ‘let go’ this bitesize course will give them the practical tools to identify opportunities for smarter working. Do you feel under pressure to react to that new email or request? Do you end up being so helpful to others that this impacts on your time? Do you feel like you will never have enough time to do the job even if we gave you another 10 hours? 4. Manage and control interruptions from above and below, without others feeling your stress.